Today’s author is QL from Smart Money and Travel Blog. 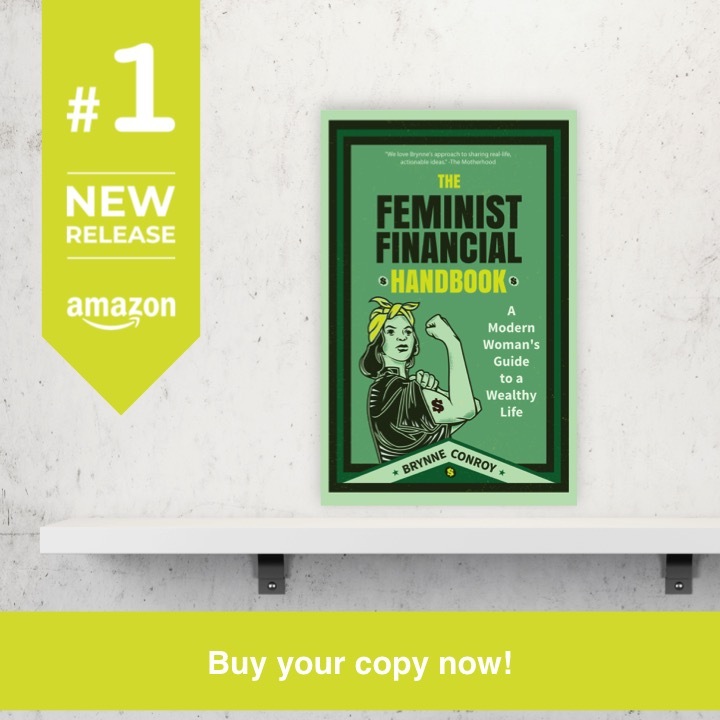 She and her husband write about personal finance and maximizing your miles and points. Our first wedding anniversary is coming up in April and we have recently taken time to reflect on the experience. Back in 2017, we weren’t exactly focused on FIRE (financial independence/early retirement,) but as first-generation immigrants, we have always been frugal and into saving for retirement. Toward the end of the last year, we decided to be more purposeful about our retirement goals. Thus, as we look in the rearview mirror on our wedding day, we wanted to share some thoughts on wedding planning. As we went through it, we didn’t always choose the cheapest alternative, but there were many areas where we either saved money, wished we hadn’t spent the money we did or were happy with our investment. Alcohol is a staple at weddings, and it can sometimes cost more than the food itself. Over half of our guests were our parents’ friends. On top of that, our venue was in a secluded location accessed by a poorly lit, windy highway. Thus, we didn’t expect many of our guests to get very aggressive at the bar. Luckily, our venue had a BYOB + corkage fee option. We made some estimates and ran the math, comparing it with the all-you-can-drink option, which was $22.50/person. In the end, we went with the BYOB option and spent a little more than $6,000 on beverages. At other weddings that we attended, we noticed that the cake was rarely eaten by guests. We also do not value taking a portion of our cake and freezing it to enjoy at some point in the future – that concept never really took hold with either of us. Therefore, we asked ourselves what we and our guests would more enjoy than an overpriced wedding cake. We ultimately decided to go with che, a Vietnamese dessert, from our favorite chain Bambu. We worked out some details with the local franchise, and the morning of the wedding we picked up 200 servings and stored them in the venue’s walk-in cooler. After dinner, we had it brought out and set up. Our vendor provided all the cups and utensils so our venue did not charge us any additional fees. Our guests loved the unique dessert idea and our only regret was not purchasing more as it quickly ran out. The che station was more popular than the bar! We spent $400 on the che. Another thing we noticed at previous weddings we attended was that many guests did not take home the wedding favors and some even threw the favors away. Thinking this through, we wanted to give something that was inexpensive, practical, and tied to our East Meets West wedding theme. We decided to go with a decorative and usable pair of chopsticks from eBay for each guest, pairing it with a printed card. Together with our wedding party and families, we spent a few hours tying everything together with a ribbon. In the end, we spent less than $100. Many of our guests collected the extras so we didn’t even have any for ourselves. When we started evaluating photographers and videographers for our wedding, we noticed that the more established ones charged a significant premium for their services. These costs easily broke $10,000 and in some cases could exceed $20,000. This was significantly more than we were expecting to pay (we were hoping to spend ~$5,000). We searched harder, looking for lesser known local photographers in Northern California on Facebook. A few stood out, and I scheduled appointments with them and flew back one weekend to meet everyone in person. I picked the one I liked the most and it ended up costing about $5,000 for an engagement session, a photo canvas, an entire day of photography (16 hours total), a photobooth, and a 5 minute wedding video. For our wedding, we hosted two dinners. One welcome dinner for out-of-town guests and the second was the formal wedding dinner. The welcome dinner for out-of-town guests was held at our brother’s restaurant about 50 miles south of the wedding venue. Our guests flew from all over the country so no one complained at all about driving the extra 50 miles. By hosting it at our brother’s restaurant, not only did he offer us a generous discount on the food, but we were also able to bring our own beer. This meal for ~30 guests cost about $100 and we gave another $100 for gratuity. For our wedding, we could choose between a plated or buffet dinner. The plated dinner cost about 50% more. Obviously, we chose the buffet option as we did not think it would negatively affect the experience for our guests. In the end, there were no complaints about the food or the environment. If we could do it again we would not change a thing. Dinner cost over $12,000 with tax and gratuity. Keeping your wedding small and doing everything yourself can save you a ton of money, however, we did neither. 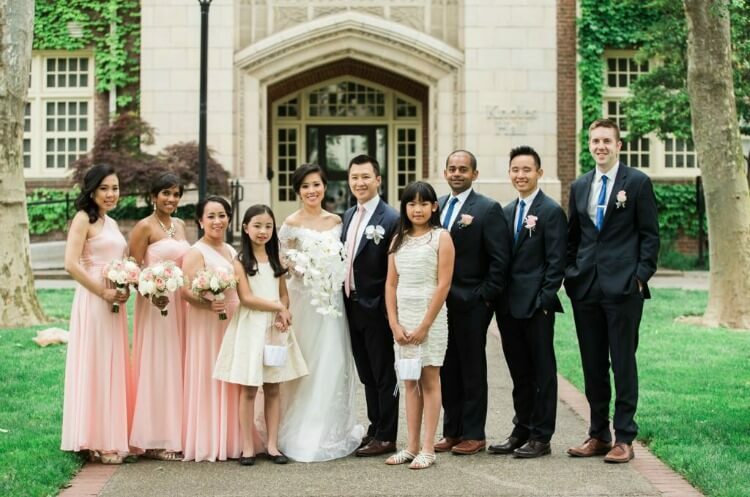 We wanted a wedding to include a lot of friends and family, and we did not have a lot of time to cobble things together ourselves before the wedding. We flew back to California from Chicago two days before the wedding and not only didn’t have the time but also didn’t want to place a large burden on our friends by asking them to help make centerpieces and other floral arrangements. Therefore, we decided to have the florist handle everything. This ended up costing us over $5,500, but we and our friends were able to enjoy the day. Many brides spend thousands of dollars on wedding dresses. I didn’t want to spend that much on a dress that is worn for a few hours. Therefore, I used my airline miles to book my mom and myself tickets to fly to Vietnam. There, I was able to buy 3 wedding dresses for $150, total, as well as get all clothing and accessories for the wedding party, which ended up costing about $170. I also got our invitations made for $115 and picked them up while I was there. If you want to see a detailed summary of our wedding costs, check out the numbers here. 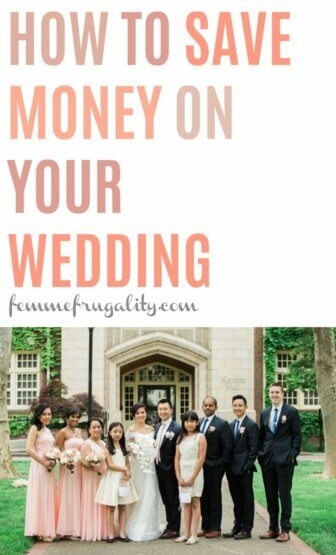 This entry was posted in Ways to Save Money, Wedding on a Budget on April 6, 2018 by femmefrugality.